Explanation: Why is there methane on Mars? No one is sure. An important confirmation that methane exists in the atmosphere of Mars occurred last week, bolstering previous controversial claims made as early as 2003. The confirmation was made spectroscopically using large ground-based telescopes by finding precise colors absorbed on Mars that match those absorbed by methane on Earth. Given that methane is destroyed in the open martian air in a matter of years, the present existence of the fragile gas indicates that it is currently being released, somehow, from the surface of Mars. One prospect is that microbes living underground are creating it, or created it in the past. If true, this opens the exciting possibility that life might be present under the surface of Mars even today. Given the present data, however, it is also possible that a purely geologic process, potentially involving volcanism or rust and not involving any life forms, is the methane creator. 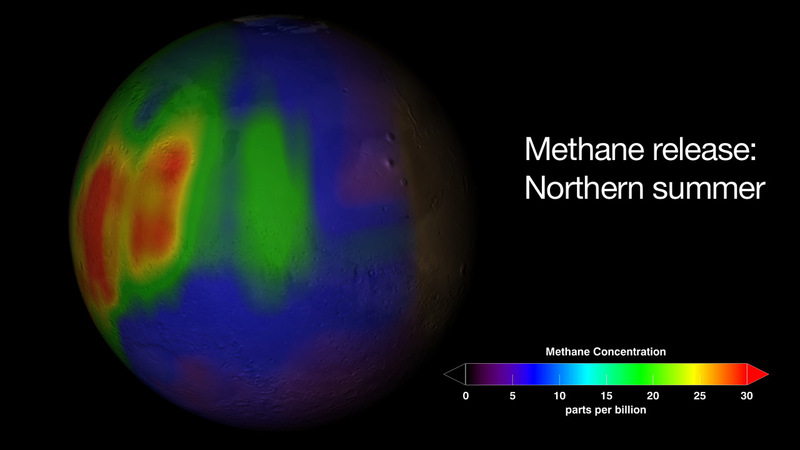 Pictured above is an image of Mars superposed with a map of the recent methane detection.